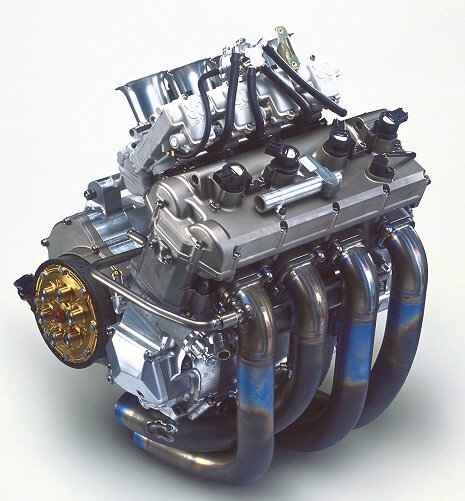 Yamaha has published the following information regarding the ongoing development of the YZR-M1 MotoGP machine, now featuring a carbureted engine (pictured). The irony here is the simultaneous release of the fuel-injected R1 street bike, featuring outstanding fuel injection (see our first ride report). The YZR-M1, Yamaha’s 4-stroke racer for the 2002 MotoGP season that has been in development for over a year, is in the final stages of testing and on schedule for its big debut. In February and March the machine will be put through final tests on the various race circuits of Europe with the aim of honing its performance over the actual MotoGP race distance. Then it will make its long-awaited race debut at the opening round of the 2002 season at Japan’s Suzuka Circuit on April 7th in the hands of Marlboro Yamaha Team riders Max Biaggi and Carlos Checa. The new YZR-M1 is powered by an all-new under 990cc liquid-cooled 4-stroke DOHC, 5-valve, in-line four-cylinder engine that has been developed by Yamaha engineers for the ultimate in lightweight, compactness and high performance. The engine is roughly 10% lighter than the 749cc engine that powers the current Superbike spec YZF-R7. Adopting a carburetor type intake system, the engine pumps out over 200 PS. The M1 utilizes a new aluminum Deltabox frame that has been developed from the successful 2-stroke YZR500, long acknowledged as one of the best-handling machines in Grand Prix racing. The new frame has been redesigned to accommodate the unique characteristics of the new 4-stroke engine. It features new dimensions and parts as well as optimized positions of their relative layout. The new design achieves the balance of rigidity that is essential to an outstanding GP racer. Also, structural elements like an adjustable head pipe and adjustable pivot axis make for fast and exacting setting adjustments to fit the many different characteristics of each race track. Here is what YZR-M1 Project Leader, Mr. Ichiro Yoda, has to say about the progress of the tests and the machine itself. That long-awaited debut will come when Japan’s cherry blossoms are in full bloom in early April at the Suzuka Circuit.